As a Virginia criminal lawyer, I know the power of the option to appeal a District Court misdemeanor criminal or DUI conviction to the Circuit Court. Numerous of my appeals have turned District Court convictions into Circuit Court acquittals, case dismissals, or more favorable settlement negotiations than in District Court. Appeals provide a chance for the defense to re-arm for battle, and the prosecution a chance to reconsider whether to be more favorable with settlement negotiations. Unless the right is waived pursuant to a plea agreement, a convicted Virginia criminal defendant has the right to appeal a General District Court and Juvenile & Domestic Relations District Court misdemeanor conviction to Circuit Court. Va. Code §§ 16.1-132 and 16.1-296. Appealing gives a Virginia criminal defendant a whole new trial. which is a second chance at an acquittal and a new opportunity to enter negotiations with the prosecutor for a more favorable case resolution than the result in District Court. The trial on appeal will be by a jury of seven (not twelve jurors, which is the number for Virginia felony trials) — Va. Code § 19.2-262 — unless both the defendant and prosecutor/Commonwealth waive a jury. Virginia’s Constitution guarantees a jury trial right in Circuit Court for criminal cases. Va. Const. Art. I, § 8. A jury conviction is only permitted when the jury unanimously votes to convict. Id. In a Circuit Court misdemeanor appeal from a District Court trial conviction, the defense has seen more of the prosecution’s hand than before the District Court trial started. This information and intelligence from the District Court stage is ammunition for the appeal. Virginia District Courts are courts not of record, and do not record their proceedings, whether by audio, video nor transcriber. 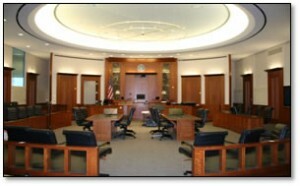 If a District Court criminal or DUI defendant anticipates a possible appeal if convicted, it is important to invest in a quality court reporter to have available for appeal a reliable record under the governing evidence rules to be used to the defendant’s advantage at the motions hearing and trial on appeal, to include locking in favorable testimony of opposing witnesses on cross examination, and impeaching opposing witnesses on their Circuit Court testimony that is contrary to their District Court testimony. If the District Court judge imposes active jail time, appealing affords the defendant the opportunity to seek an appeal bond, to remain out of jail during the pendency of the appeal. In some instances, a convicted misdemeanor criminal or DUI defendant sees value in the appeal’s delay of the start of such terms and conditions of the District Court sentence as jail, and suspended driving in DUI, reckless driving, hit and run, and fleeing police cases. Here is Part II of this article, on addressing the risks of criminal appeals to Virginia Circuit Court. Northern Virginia criminal lawyer/ Fairfax DUI attorney Jon Katz since 1991 has successfully defended thousands of people charged with felony, misdemeanor and DUI offenses. He is conveniently located to meet with you in confidence about your case, in his Fairfax City office and satellite Arlington, Virginia, meeting office, with both offices within blocks of their respective courthouses. To schedule a meeting with Jon, please call his staff at 703-383-1100.